Crystal Mountain, WA – Control ropes exist at western ski resorts for a very good reason, as one wayward skier nearly discovered the hard way last week at Crystal Mountain. Along with the entire Pacific Northwest, Crystal Mountain has been receiving prodigious quantities of snowfall thus far this season. As much as 10 feet of snow has fallen upon Crystal in just the past week, creating the potential for very large and deadly avalanches. Ski patrollers generally force slopes to avalanche by placing hand charges that typically contain two to four pounds of explosives. 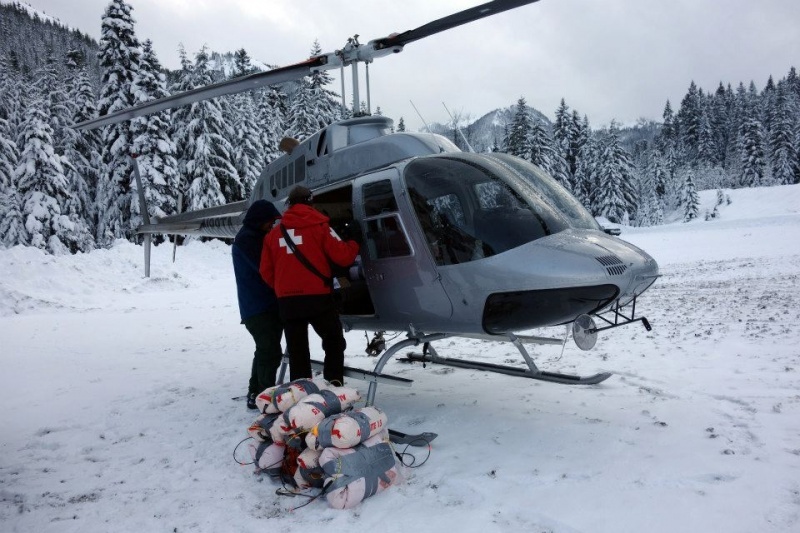 With that much snow, however, Crystal patrollers brought out the big guns last Friday, dropping 25- to 50-pound charges from a helicopter in an effort to prompt stubborn slab avalanches to release. Charges that big are enough to rattle the plexiglass windows in the heli as it scurries away. One focus of their efforts that day was the Employee Housing slide path adjacent to The Niagaras. A patroller was stationed at the rope line to ensure that no one would enter the area as the heli hovered into position above the avalanche start zone. Patroller Christina von Mertens, stationed in the helicopter, lit the 90-second fuse on a 25-pound charge and tossed it out the window onto the Employee Housing slide path…just as a skier ducked the control rope and skied toward the explosive. “The ski patroller positioned along the rope line yelled at him, ‘Fire in the hole! Avalanche control in progress! Fire in the hole!’ The skier, dressed in all black, looked up at the patroller and stopped,” says Kircher. “Then he did a very stupid thing. He dug his poles into the snow and pushed off into the open slope. Crystal Mountain Snow Safety Director, Chet Mowbray, and Patrol Director, Paul Baugher, watched on in horror, helpless to stop the scenario unfolding before them. Onlookers screamed at the skier from the parking lot below. With less than 20 seconds remaining on the fuse, the skier passed directly over the explosive. It’s hard to fathom how the poaching skier wasn’t blown away by the concussive force of the explosion. He’s also extremely lucky that the stubborn slab in Employee Housing didn’t release. In the frenzy following the explosion he escaped apprehension. In his wake, however, he left a trail of frustration and frazzled nerves.